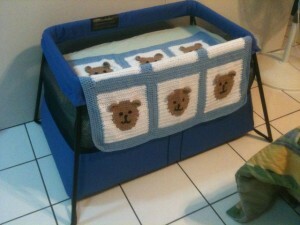 In Xela we prepped the baby’s bed by buying 5-inch mattress foam and cutting it to fit inside our BABYBJÖRN Travel Crib . We used three pieces and had them covered with regular sheet material we had purchased at Megapaca. A sastre or sewing guy, made the mattress cases with a zipper for us so we can change them as needed. The new mattresses gave 15 inches of lift to the modified play pen so our baby would be at a bassinet level and we can lower it as he gets bigger. With the help of other missionary friends, we connected with Tammy Coates, a missionary who has had seven home or natural births (three in the states and four in Guatemala). 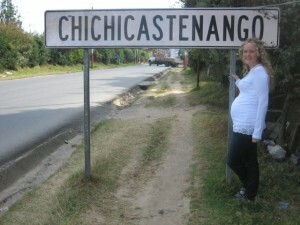 Conveniently, she lives with her family just outside of Xela in the village of San Juan. Tammy connected us with a local Mayan comadrona named Asusana. We intended to use Asusana at our son’s birth. The Coates graciously offered us the use of their guesthouse and birthing pool so we started making plans to have our firstborn son in San Juan. Everything seemed to be coming together! However, as time progressed, we received good advice from veteran missionaries who knew this country and the medical system here better than we did. They expressed enough concerns about us giving birth more than five hours from the really good hospitals in the capital so we decided to see what options for natural birth we could find in Guatemala City. Sure enough, our missionary friends came through again with the name of a German midwife who has been practicing in Guatemala for years. 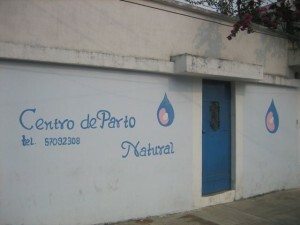 She has a clinic called Centro De Parto Natural in the capital not far from the airport and near the best NICU in the nation at Roosevelt Hospital. As far as we can tell, she’s the only English-speaking midwife in the capital and possibly the only midwife with a birthing clinic. So, everything was set. We took a break from our Spanish School in Xela and moved to the capital, Guatemala City on April 17. We moved into an apartment loaned to us by our ASELSI friends in a gated community in the suburb of San Cristobal. (Right off of San Cristobal Boulevard near Pizza Hut.) We had an appointment with midwife Hannah at her private clinic called Centro De Parto Natural on April 21 (This was changed to April 19 due to Semana Santa vacation on the 21st). After our first meeting, we decided she was the midwife for us. We paid US$1,710 (Q13,000 @ 7.6Qs to the dollar) for the birth package. Chrisi’s belly measured 35 cm and the baby’s heart rate was great! 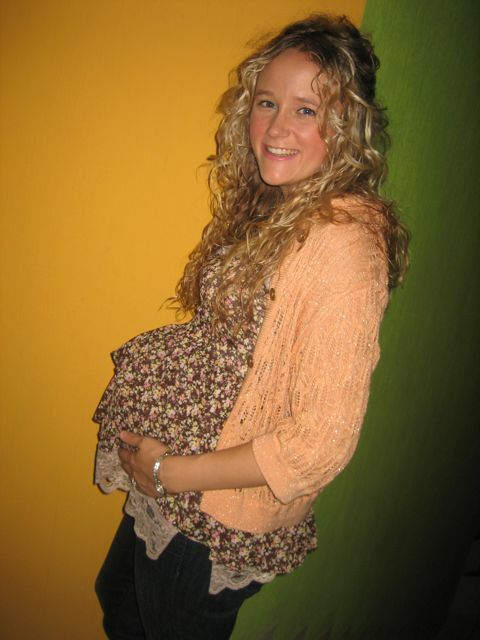 Chrisi was then 36 weeks pregnant. Chrisi at about 40 weeks. The time spent in the capital before the baby arrived proved to be a fun time of getting to know our new city. Our neighbor missionary, Jan Morrison, often loaned us her vehicle and Michael drove in Guatemala for his first time. He said the traffic wasn’t as scary as it looked. The hard part was knowing where we were going or at least how to get there! On one trip we ended up going the long way up around the mountain to get back to our apartment in San Cristobal because we kept making wrong turns and our GPS led us the long way around the mountain. Nevertheless, we made it! We also made it out to several missionary garage sales and were able to pick up several items for the baby, including a stroller, car seat and a nice rocking chair that will come in really handy in the future. The Intermission e-mail updates for missionaries kept us up to date on when things were for sale. On Monday May 2nd Chrisi started feeling little crampy pings that continued up until the birth. 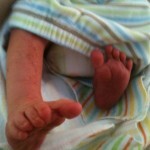 We went to our second appointment at the birthing clinic on May 3. Chrisi’s belly measured 37.5 cm. and baby was doing great. We continued to refer to Hudson as baby in public because we were keeping his name a secret until he was born. Everything was going great as the baby grew, and we got closer to our due date of May 15. At this appointment we told Hannah that we’d plan to meet her at the birthing clinic on May 17th if the baby hadn’t come by then. Hannah said she didn’t think we’d make it to the 17th before Hudson would be born. Sounded good to us! The baby dropped before the next appointment and Chrisi’s mom said she could tell that he had dropped when Chrisi showed off her baby bump on video Skype. Skyping proved to be a great way to keep in touch with family since we could spend time chatting together and see each other too. May 15 came and went without any sign of Hudson wanting to show up. 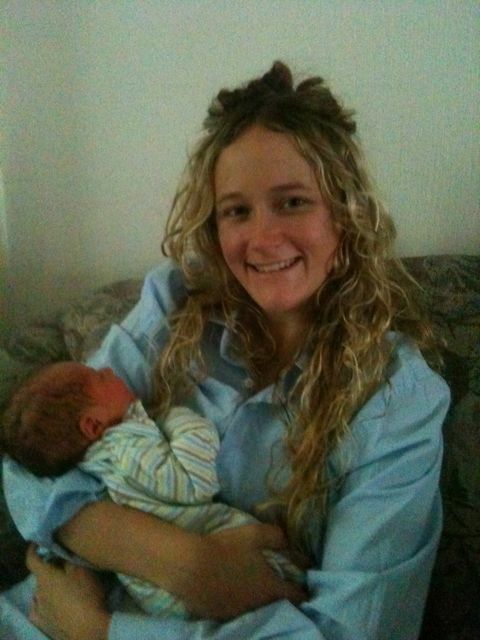 So we met with Hannah at the birthing clinic on May 17th. Hannah agreed that the baby had dropped. Chrisi’s belly measured smaller at 34 cm. The baby had definitely dropped into her pelvis giving her belly a smaller measurement than last time. Baby was fine so we agreed to meet with Hannah whenever he decided to come. We expected that to be within a matter of days. On May 21st we were talking and realized that we had miscalculated our due date. Chrisi reviewed the details: she had a negative pregnancy test on Sept. 7, 2010 and re-checked on Sept. 9 when it showed up positive. This indicated that we conceived on August 25 or 26. Using these numbers we realized that our real due date was May 19. So we were late by two days instead of the six days we originally had thought. On Tuesday, May 24, Hannah called us. Chrisi said she had been having some more light cramps and explained the due date difference. Hannah agreed that we could wait until Monday the 30th of May before getting any ultrasound to see how Hudson was doing since we weren’t as late as we had thought. On Wednesday May 25 Michael was working on some Spanish and on his computer while Chrisi took a nap. Then things started happening. During her nap Chrisi woke up about every half hour to hour with her tummy getting hard. She had been having Braxton Hicks contractions for a few weeks, but this day was different because there was a crampy muscle tension feeling associated with them. At about 4:30 p.m. Chrisi was sitting next to Michael talking about insurance when our neighbor, Jan, dropped by to see how the baby was coming. We let her know that Chrisi was starting to feel regular contractions. It wouldn’t be long! It was 4:27 p.m. when Chrisi started counting contractions that were at 8-, 9-, and 8-minute intervals. At about 5 p.m. Chrisi went to the outdoor bathroom. When she came back from the bathroom, she told Michael she lost her mucus plug. We went and took showers to be ready to go when it came time to go to the clinic. We continued counting contractions as the evening went on. We enjoyed our time together resting and hanging out as we waited for our son to be born! At about 7 p.m. Chrisi had five light contractions during a conversation with our neighbor. We told our neighbor, Jan, that we were definitely in labor and that our son was coming soon. We noticed lightning in the west and later that evening it began to rain. 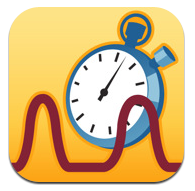 By 10:26 p.m. Michael found an App for his iPhone called Contraction Timer that was free in the App Store so we kept track of regular contractions with it. At 10:30 p.m. contractions were 4 to 6 minutes apart and lasting about 45 seconds. At 11 p.m. they were 6 minutes apart and lasting about a minute. During the midnight hour they had become more frequent, but slowed a bit to about 4 minutes apart and varied between 20 and 40 seconds. At about 1 a.m. on May 26th, we went for a long walk through the quite neighborhood. The rain had stopped and the cool air felt good as we walked beneath the streetlights. We could see the glowing city lights down the hill from San Cristobal. When we got back to the apartment, Chrisi encouraged Michael to take a nap. She let Michael sleep from 1:45 a.m. to about 3:15 a.m. Chrisi watched some T.V. and enjoyed some ice cream and the chocolate cake she had made earlier in the week. She walked about the apartment and tried to relax during contractions. At 3:15 a.m. Chrisi called to Michael. She was having contractions every 3 to 6 minutes and they were lasting up to a minute and a half. We waited until 3:22 a.m. to call Hannah. She said she’d head in to the birthing clinic and call us when she got close. At 4:16 a.m. she called back and we called our faithful taxi driver, Ruben, who had taken us to the birthing clinic at all our previous appointments. He arrived at about 4:25 a.m. Michael had all our pre-packed bags up under the carport. Ruben and Michael loaded the car then Michael returned to help Chrisi up the stairs. She had one more contraction before they got in the car. Michael took in a load of bags while Chrisi walked out the contraction by the taxi. Hannah asked if Michael had brought Chrisi with him and he assured her that he didn’t forget her. When Michael got back to the car Chrisi was loading herself up with bags to help bring them in. Michael tried to dissuade her from carrying them, but she said she was fine and headed into the clinic. 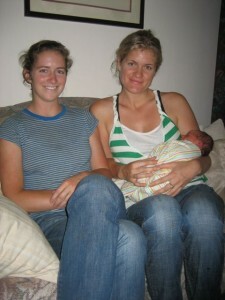 In the birthing clinic we met two of Hannah’s interns, Meg and Laura, they were there to assist in the birth. Meg had trained as a Certified Midwife at the same school as Hannah in Texas. Laura had some experience as a doula. Michael set up our stuff in the room while Hannah checked on Chrisi’s blood pressure and talked over how her contractions were going. Laura, the midwife intern, made some labor tea for Chrisi. It was made from cinnamon, laurel, cloves and ginger and had a pleasant aroma and tasted good. At 5:17a.m. we called Chrisi’s parents and let them know that Chrisi had been in labor for about 12 hours. It was 7:17 a.m. Michigan time. We also called Michael’s parents. At 5:46 a.m. we sent out e-mails for our friends at ASELSI to ask for prayer. Contractions continued and we did a lot of walking. The gated neighborhood where the birthing clinic is located in Zone 13 proved to be a nice area for us to walk. As we walked we saw the trash truck come by and pickup the morning trash. Vegetable vendors sold their melons and pineapples and other produce to the neighbors and we continued to walk. Later Michael noticed that Chrisi ended up with a light sunburn on her shoulders from all our walking in the sun. During these morning hours the midwife team slept on the couches. This was great for us because it gave us our own time. They just checked on us to make sure things were going well. At 9:45 a.m. Hannah checked Chrisi to see how far along she was. This was the first time Chrisi had been checked. Chrisi was dilated to 7-8 cm. Hannah was surprised to see how far Chrisi was since she seemed so calm and quiet during labor. Meg, who has attended over 120 births, said Chrisi was the calmest woman she had ever seen get that far in the labor process. Chrisi said she could feel the contractions but all the walking we did along with focusing on relaxing her body and letting the contractions do their work helped relieve the “strong discomfort” of the contractions. Hannah said that maybe singing helps with the process because she had noticed that we were singing praise songs. When we were in the clinic we had praise and worship music playing throughout the labor. Michael often sang to Chrisi as they walked the neighborhood. She particularly liked when he sang the “Cares Chorus” about casting all our cares on Christ. Chrisi and Michael both sang along with some of the Christian worship songs they had playing in the clinic. Chrisi later said she could learn all the Lamaze and other relaxation techniques, but what worked best for her was praising God through songs while in labor. This time of worship truly revitalized and strengthened her. Even during contractions, she found that singing praises was very helpful to relieve the discomfort as she paced through the birthing clinic. It helped her focus on how God was faithful to help her get through all that to hold her baby in her arms. At 10:26 a.m. Michael sent an e-mail asking for prayer from our RWM board and the ResLife Missions board. We continued walking. That seemed to keep the contractions going and make them more tolerable. At about 11 a.m. we had the midwife crew fill the birthing pool since Chrisi wanted to try and see if she liked it. 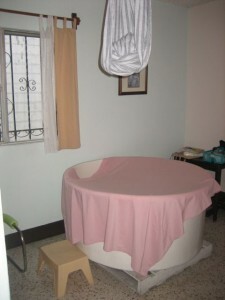 The birthing clinic has several options available for birthing moms to use: the birthing pool, a birthing seat (though it could use better padding to make it comfy), a bed and a cloth loop hanging from the ceiling that the mother can hang onto or use as a support as she squats. They also have a birthing ball for women to use. At around noon, Chrisi tried out the birthing pool. The water had been purified with Grapefruit Seed Extract and was at about body temperature. Chrisi sat in the birthing pool, walked in the birthing pool and squatted in the birthing pool. When she sat in the water for about five minutes, it was comfortable but she stopped having contractions. When she stood up in the birthing pool, she immediately got another contraction. After about 20 minutes she got out because she found that while the water felt good, it slowed down her contractions and just delayed the process. She went back to walking because the water wasn’t helpful to her. Later she tried the pool again and had the same results. She decided to stick with walking. Many women say that birthing pools are the best way to have a baby, but Chrisi found that for her it slowed down the birthing process. The two midwives agreed that it can slow down the process especially for women who are less than 6 cm. dilated. Chrisi tried the birthing pool at about 8 cm of dilation, but it wasn’t helpful to her. At 2 p.m. Chrisi had Hannah check her again to see how things were progressing. She was 9.5 cm dilated. Hannah said Chrisi could start pushing any time she wanted because the last .5cm lip of the cervix would move out of the way as the baby descended. Still, Chrisi had no pushing urges, just the ongoing contractions. At 2:21 p.m. Michael e-mailed the Victory Christian Center missions director asking for prayer. Chrisi started pushing during contractions. This continued for four hours. Chrisi continued to walk with Michael. They walked outside and Hannah went to another quick appointment across town. They were walking when she returned and asked her to add more water to the birthing pool. This was when Chrisi tried the birthing pool for a second time and decided that it just wasn’t helping. 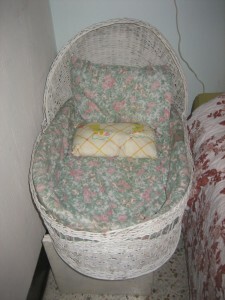 She started squatting at the corner of the bed in the birthing clinic’s bedroom. Hannah said squatting helps open the pelvis and could speed things up. Yes, she’s smiling between contractions! Chrisi tried using the cloth loop that was hanging from the ceiling but it wasn’t real comfortable on her arms. Things continued slowly. Michael and Chrisi were told that it’s not uncommon for a woman in labor to have a pause in contractions during the transition phase as the body gets ready to push. During the whole process, the midwives had checked the baby’s heart rate and he was fine. Baby heart rates over the whole process ranged from 124-140 beats per minute (well within normal limits). The Baby Fetal Heart Rate Monitor for checking the baby’s heart rate was annoying since the machine had a short and kept not working. Meg had to keep shaking the device to get it to work. Around 4 p.m. Hannah casually offered to help make sure Chrisi was pushing correctly since she had been pushing for 2 hours and still had no urge to push. Chrisi described how she was pushing and Hannah said it sounded like she was doing it right. There was no real concern so Chrisi said no to the check and kept pushing with each contraction. Throughout this entire time, she was moving freely about the clinic. The midwives and Michael and Chrisi were the only ones there except for a short time that evening when some other clients stopped by. When they were there, Chrisi had to stay in our bedroom to keep her privacy until they left. This didn’t bother her at the time because it gave her time to focus without the midwives checking in on her. We passed the 24-hour mark as she continued pushing, Chrisi had back pain so as she sat on the birthing stool, Michael gave counter pressure by pushing on her lower back to help relieve the pain. We tried this counter pressure in different positions to help relieve the pain. She didn’t like being touched during contractions, but this counter pressure seemed to help. At 6 p.m. Hannah talked with Chrisi about checking to see if the baby’s head was in the right position and to make sure she was pushing correctly. Reluctantly, Chrisi agreed. Chrisi didn’t like the idea of Hannah putting her fingers inside her. However, when Hannah checked, the baby’s head was tilted the wrong direction making it difficult for him to move through the birth canal. She tilted his head and had Chrisi push as she kept the baby’s head in the right position. Chrisi sat on the birthing chair while Hannah helped direct Chrisi’s pushing and make sure the baby’s head didn’t slip back into the wrong position. Chrisi cautioned Hannah not to hurt the baby, and Hannah assured her that she would not. With a bit of fear, Chrisi let Hannah check and help guide the pushing. When Chrisi started getting scared she sometimes grabbed Hannah’s arm and held it in case she needed to pull her fingers out. Hannah was very reassuring and careful through this whole process. At about 7 p.m. the baby’s head locked into the right position and Chrisi started having the urge to push that we’d been waiting for! Hannah continued to encourage Chrisi to put her strength into each push and the baby slowly moved down the birth canal. Throughout the evening, Hannah had Laura make Chrisi some teas and a drink of about 20 drops of Black Cohosh in a small amount of Gatorade. Chrisi drank this mixture and held it in her mouth for about 20 seconds to let the Black Cohosh absorb into her mucosa of the mouth. This helped speed up the contractions. Also, Chrisi received some tummy rubbings and stimulation to speed up the contractions. Hannah provided Chrisi with some homeopathic remedies to help give her energy. She took about nine of the sugar pills in total during the labor though Chrisi didn’t notice any change after the sugar pills. The midwives let Chrisi know that she could give birth in the next two hours if she kept at the strong pushing. Amazingly, Chrisi went from three strong pushes per contraction to four. Hannah left the birthing room while Meg, who is a certified midwife herself, continued with the fetal heart rate checks and encouraged Chrisi with her pushing. 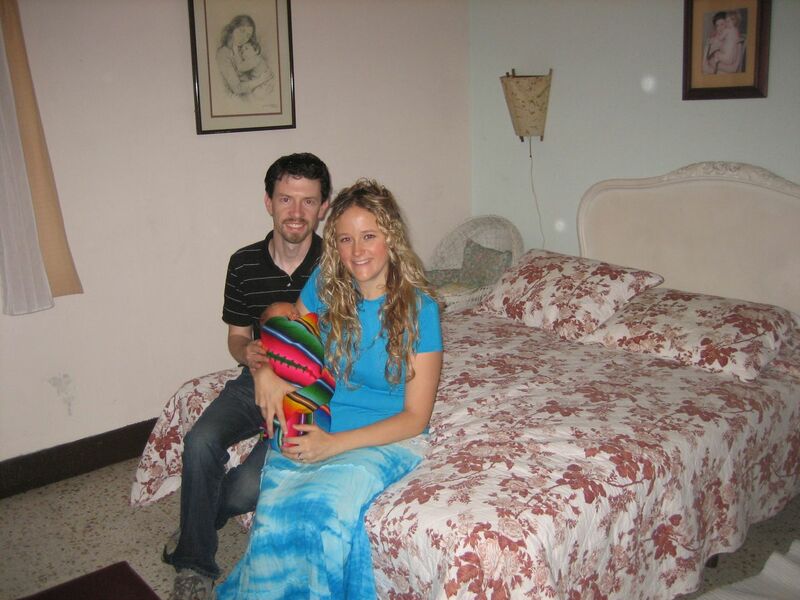 Eventually, Chrisi started squatting at the edge of the bed in the birthing room with Michael sitting behind her. He had his arms under hers and would support her as she pushed, then he helped her stand when she was between contractions. Things slowed down a bit and eventually Hannah came back in to check again and she encouraged Chrisi to push with her strength so the baby could be born on the 26th. At 11:18 p.m. Meg commented, “Will the baby be born today or tomorrow?” Chrisi quietly decided that she didn’t want to wait until tomorrow. She was going to push him out today. She’d been in labor all of Thursday the 26th, and she was going to have her baby on the 26th. With Hannah and Meg’s encouragement, Chrisi showed amazing strength and put her physical energy back into her pushes. She had been in labor for over 30 hours. Intense pushing continued and the back pain that Chrisi had been experiencing passed as the baby’s head moved further down. He was getting closer and closer to being born! At one point the baby’s head and a toss of dark hair was visible and the midwives told Chrisi she could feel him between contractions. 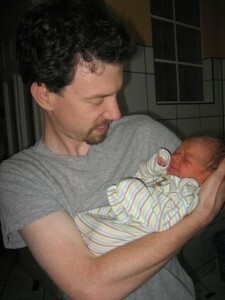 Chrisi and Michael felt the baby’s head and could feel the caput swelling on his head caused by the delivery process. Chrisi was disappointed that she could only feel a little of his head since she had been pushing for so long. When the midwives placed a mirror so Chrisi could see the baby’s head, she looked but then went back to concentrating on her pushing because there was only a little of his head visible. They offered to let her see him with the mirror again later and she said no, she wanted to see all of him not just the top of his head and she continued pushing. Chrisi’s endurance during this long labor was amazing. Michael was impressed by how strong she was throughout the entire delivery. She grunted with some of the pushes but never did she scream or cry out despite the pain she felt especially as the baby’s head crowned. 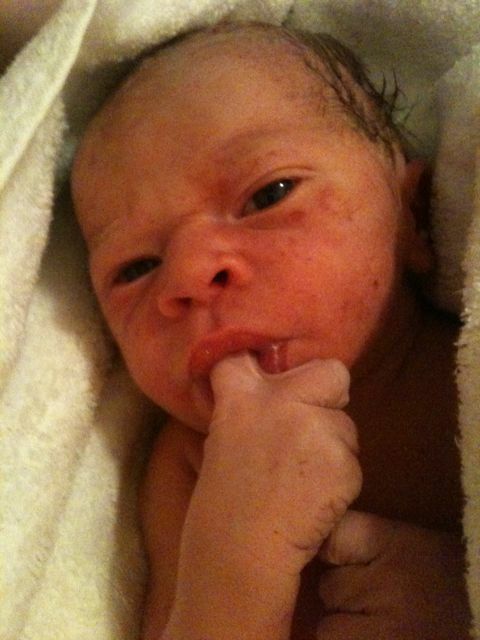 Our baby started sucking his finger within minutes of being born! After 31 hours of labor (Almost 10 of which Chrisi was pushing) at 11:39 p.m., Chrisi gave one more push and Hudson Michael Shead was born! She gave birth to him in a squatting position with Michael supporting her. Midwife intern Meg caught him as he came out. She removed the umbilical cord from off of one of his shoulders. He started crying with a loud voice just seconds after being born. He has strong and healthy lungs and he was not afraid to let everyone know that he had arrived! He had a head of dark hair and was wiggling and warm. Meg handed him to Chrisi and she held him to her chest. Michael was crying as he patted Hudson’s back and publicly declared his name for the first time. Chrisi said she was a bit shocked to see him come so quickly right at the end. She thought she still had about 20 minutes of pushing to go. When she held him in her arms she was so exhausted that she couldn’t even really wipe him off. Chrisi asked the midwives if she should wipe him off, but the midwives said he was fine and that she could just enjoy holding him. 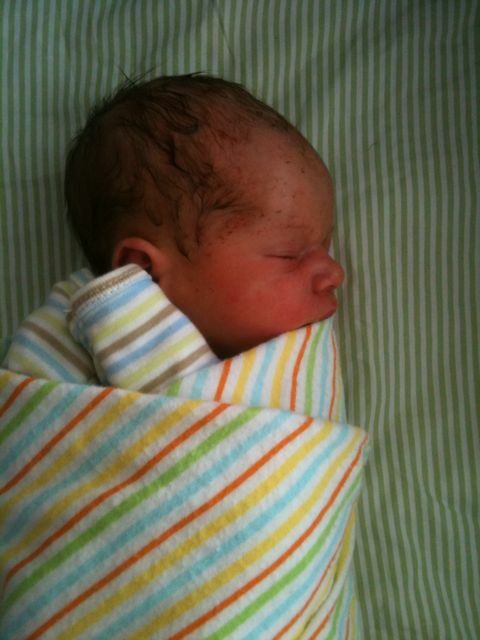 In the quiet, loving environment of the clinic, the midwives covered Hudson in a warmed towel and Chrisi held him for a while. Hudson was perfect. He had a slight caput (swollen spot) on his head from the long delivery, but the swollen spot was gone 24 hours after the birth. As Chrisi held Hudson, Michael cut the umbilical cord (He noted that they need better scissors at the clinic.) and Meg took cord blood for a blood test to see his blood type. His blood type would determine if Chrisi needed a Rhogam shot or not. We talked to the midwife later to find out why the labor was so long and she said it was because the umbilical cord was over his shoulder and acted as sort of an upside down seat belt. This prevented him from descending properly. It also kept his head from engaging in the normal time frame. Being disengaged, he was able to move his head which put it in the wrong position for birth. This also explains why Chrisi had no urge to push even though she was fully dilated. Thanks to Hannah’s expertise, she was able to reposition his head. If it were not for a midwife who had such vast experience, Chrisi would have probably needed a C-section. Chrisi handed Hudson off to Michael while she birthed the placenta while standing up next to the birthing pool. It took about 20 minutes. Chrisi lost over 1000 mls of blood. That’s about twice as much as normal for a natural delivery and about the same amount a woman looses during a C-section. (We later found out that she should have birthed the placenta lying down. Hannah said this may have saved her some blood loss.) After delivering the placenta, Chrisi rested on the bed, drank water and Gatorade, and ate snacks to get her energy back. She felt like she could pass out because she was weak and a bit nauseous so she rested for two hours. During all this, Michael held Hudson and enjoyed looking at his little fingers and toes as he got to know his son for the first time. Chrisi wasn’t able to nurse during this time because she was feeling nauseous and weak. Michael handed Hudson off to Meg while he checked on Chrisi and went to the kitchen to get a bowl for her in case she needed to throw up. Chrisi was going to take a shower, but because she was too weak, Meg cleaned her up with a moist cloth and we decided to go to bed and shower the next day. Meg weighed Hudson. He was 6 pounds 9 ounces. We were all so tired that we decided to do the newborn assessment in the morning. We went to our room for the night and it was just our own little family. During this time, Hudson cried some but was really pretty content. Chrisi nursed him a little, but he didn’t really latch on. Michael spoke a blessing over Hudson and we put him to bed in the small bassinet beside our bed. After that, we got some much-needed rest. The next morning we woke up and Michael went to the kitchen and warmed up the rest of our chicken pasta. Hannah stopped by our room to see how we were doing before she left for another appointment. Chrisi nursed Hudson a little just to get things started and this time he successfully latched on . Then Meg came in and we did the newborn assessment. Hudson was healthy and whole and was 19 inches in length. At 10:45 a.m. Laura made Chrisi some more Fenugreek tea (to help with milk production) while Michael called a taxi. Ruben was busy so Michael called the Amarillo Taxi for our ride home. The taxi arrived about 10 minutes later and Michael carried the bags out to the car as Chrisi chatted with Meg and Laura. We got a photo of Hudson with them right before we left. Later we found out that we could have stayed longer and that Hannah was coming back. Michael was under the impression that the midwife interns had to leave so he called a taxi and arranged for us to get home. Looking back we were glad to be home because we all got some much-needed rest. On Friday afternoon, Hannah called us and let us know that Hudson’s blood labwork was done and his blood type was A+ so Chrisi did need the second Rhogam shot. (Chrisi had her first shot at 28 weeks as a precaution.) Michael borrowed Jan’s car and went to four different pharmacies in the area looking for the medicine. None of them had it. On Saturday we called Hannah and asked her for help getting the medicine since our deadline of 72 hours after the birth was rapidly approaching. She called around and gave us the number of an English-speaking contact with Bayer. * Saturday afternoon, Michael met him at Pizza Hut and paid Q1,000 (about US$130) for the medicine. At home, Michael and Chrisi read over the instructions and Michael cleaned off Chrisi’s upper arm (Deltoid muscle) with rubbing alcohol and gave Chrisi the injection. She was a bit reluctant to let him do it at first, but he convinced her that we just needed to do it and be done with it. When Michael finished, she said it didn’t even hurt. He did a wonderful job. It was a relief to have that taken care of. Our little family in the recovery bedroom when we later visited the clinic for a checkup. Guatemalans loved looking at 3-day old Hudson when we were at the Megapaca. It’s been four days and Hudson is nursing well. Last night he slept for 5 hours and Chrisi was glad to get a good night’s rest. We don’t let him sleep more than that because he needs to feed and keep up his calories. He’s getting into a good routine. We visited the Megapaca and 3-day-old Hudson was the most popular item in the store. We had many people come up to us and want to see the new baby. One family even took photos of him. We already see how God is answering our prayer that our son would help us connect with the Guatemalan people so we can share the Gospel with them. Check out our other blog entries to find out how we got our baby paperwork for Hudson and read the story of our second baby’s birth here. 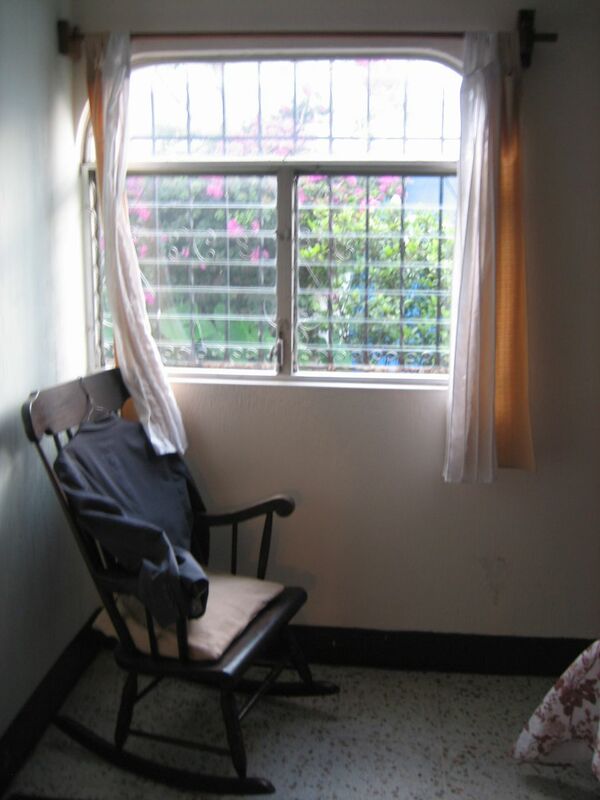 This entry was posted in Medical, Pregnancy, Resources, Saving money, Travel and tagged baby, birth, birth clinic, birthing pool, Guatemala, Hannah Friewald, international birth, midwife, natural birth, Rhogam, water birth by michaelshead. Bookmark the permalink. So glad that you shared your birth story! I’m so glad that you were able to have a natural labor! May God bless you in your mission work in Guatemala!! Beautiful story! Very proud of you guys! Can’t wait to meet this handsome little man!! Wonderful! HalleluYah for the miracle of childbirth, and for the fruit of the womb. God knew exactly what mama and baby needed. Praise Him! Wow! That was one long labor. The midwife and the interns are tops. I would have taken for C-sec after 4 hours of second stage. Liked the “praise n worship” part and pronounced a blessing. God bless you both and Hudson as you minister for him. Pingback: A new generation is born! Congratulations, you guys! Chrisi, you did an amazing job! What a blessing to have such a skilled midwife. Long labors are hard but so worth it in the end. Thanks for sharing your story!!! it is awesome, and Hudson is just adorable!! We had a great time with you guys yesterday, and I really enjoyed holding your baby, God bless you guys!! and we hope to see guys during this week before you guys go back to Xela..
We read the entire post. Well done good and faithful servants! Beautiful story, i am a first time mom-to-be and have been wondering on whether or not i was able to have a natural child birth. Reading your amazing story i feel so much more confident that i will be able to, thank you so much for sharing your experience, it gives me so much hope i’ll be able to do this naturally. God bless your beautiful family. Great to read your story! I am curious what mine will be like next year. Thanks for sharing your experiences. I came across your birth story through the midwifery today forum, and loved reading it! We have much in common, I too had a long labor with my first baby, and traveled to Guatemala for two months with my husband and 9 month old baby to work with Hannah at Centro de Parto Natural! My prayers are with you and your work in Guatemala. Congratulations! Thank you for your prayers! We’re loving being here in Guatemala and I love being a Mommy! Greetings! 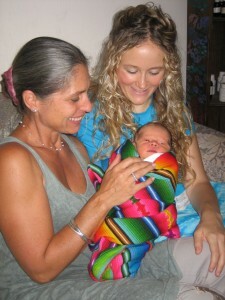 I am a midwife just now starting a birth practice in Mexico, and I have a mama due in about three weeks. 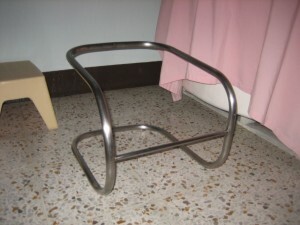 I have a birth tub, but am trying to find out how to purify the water! Your story mentioned grape seed extract. Is that grape seed, or grapefruit seed? Do you know how much they used? Also, can you maybe forward the email address of the midwives to me so I can ask them how they do it? Thanks! Congratulations! Hi! I met you guys briefly at Intermissions– I am having my first with Hannah in 4 months. I loved the post and your attitude about having you kids here in Guatemala. I can’t wait to meet our daughter and am kinda looking forward to the whole birth experience. So glad you are connecting up with a great midwife! Natural birth is a great way to bring a child into this world and it’s very doable here in Guatemala! Let us know how it all turns out for you! I’d love to read your birth story if you want to share it!